Relationship marketing is connecting with your current customers through various marketing campaigns and promotions with the main idea of creating loyalty and retaining the customer. A relationship marketing strategy focuses on converting single sales to repeat sales, it has a dedicated budget to meet the customer acquisition cost and creates lasting relationships with the customers by gaining their loyalty. It plays a vital role in growing and sustaining your business. As a marketer, you might think it’s less expensive and easier to sell to your current customer base. But, that’s not the case. The fierce competition in the market, the promotions and offers that are rolled out to woo the customers, create a big dent in your revenue plan. Traditional transactional marketing revolves around two main principles – gauging the interest of your audience and making a transaction (selling the product or service). This transaction, at the same time, brings revenue to the brand and solves the customer’s problem. Scoring a conversion or closing a sale is the source of joy for every business owner, but there is one big problem – it’s a one-time thing. A customer can easily find a better brand and purchase their product the next time they have the same need. What makes relationship marketing special is that conversions and sales aren’t the goals – they’re just the beginning of a relationship. This approach to marketing helps your brand flourish thanks to basic human psychology. Your average customer doesn’t purchase services or products because of boredom. They do so because they have a need that is to be fulfilled or a problem that has to be solved. When a person makes contact with your brand, their loyalty in the future depends on three key factors. Trust. The brand or service is as good as advertised and better, ensuring the customer that they won’t be swindled. If your services are stellar, why should a customer risk getting swindled or having an underwhelming customer experience? Knowing that the brand cares. When a person sees that a brand genuinely cares about how they feel and how do they interact with the product, they will appreciate it. After feeling wanted and establishing communication with a brand, people return to it willingly and with pleasure. Mitigating possible problems. A lot of people expect a service to be perfect. Transactional marketing is designed to learn from mistakes or flaws and give up on the customer. Relationship marketing, on the other hand, focuses on finding solutions to the problems and showing people that the brand is as human as they are. Fostering a relationship with your customers starts by establishing trust, followed by acts of care and goodwill. The relationship only becomes rock solid if you invest enough effort into mitigating problems, not just preventing them. All of this results in an overwhelmingly positive customer experience, which evokes emotions and creates a connection. But how can relationship marketing benefit your business? Did you know that just a 2% increase in customer retention results in as much as 10% less expenditure? It is indeed true. When you think about it, acquiring a customer is expensive. To reach just one customer, you have to invest a lot of time and resources for gathering analytics, designing a campaign and targeting the right people. Relying solely on attracting new customers is an unsustainable business model. 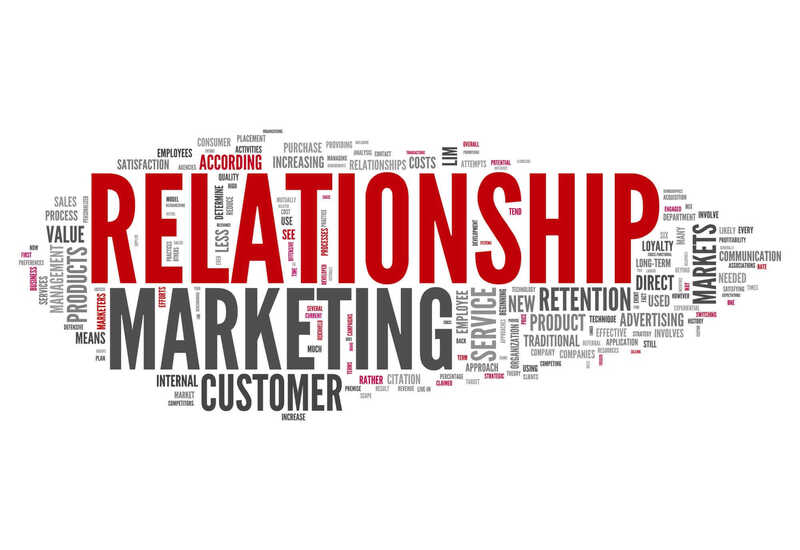 For small businesses, relationship marketing is more important than anything else. If you start right and establish close relationships with your customers, they will form a customer core. This means an increase in both sales and a decrease in expenditure on aggressive marketing campaigns. Word-to-mouth marketing is more powerful than even the most efficient inbound strategy. According to Nielsen, 92% of consumers trust recommendations from people close to them more than anything else. By fostering strong relationships with your customers, they will start talking about your brand to those around them. Since belief in those around is so deeply rooted, strong relationships with existing customers will attract new ones. Not only will your brand grow, but you won’t have to spend a cent on elaborate customer attraction strategies. The best advertisement is a happy customer. By having developing relationships with your customers, you gain much more than finances and popularity. With every interaction with one customer, you will find out more and more about them. There is so much you can find out about what they like and what should you focus on. Use social media channels to demonstrate your willingness to form relationships. Act smart and implement tools such as EssayWritingLand. With it, you can outsource content for your page or blog. Order blog posts with a tone specially designed to let the audience know you want to be their friend, not just a mere service provider. Don’t stay complacent. Relationships require a lot of work. Monitor your most successful relationships and repeat all the right things. Follow trends and read a lot. Improving relationships while they’re already functional will make them even closer. Communicate. Respond to all comments, review – especially the negative ones. Use social media to show your audience that you care. Growing a business is inseparably tied to growing your brand-customer relationships. By adopting the principles of relationship marketing, you will save money and accomplish all your goals. Slowly, you will become more than a brand. By nurturing relationships with customers, you become an integral part of their lives, improving your reputation and bettering the world at the same time. Guest contribution by Alexandra Reay: an editor and a regular contributor to EssayShark project. She is also a professional content writer who prefers to do research on the following topics – self-improvement, technology innovations, global education development ets. What Is The Difference Between A Business Model And A Business Strategy?